'Where Israel feels its existence depends on action, it will take it,' says Maj. Gen. Nimrod Sheffer, head of IDF Planning Directorate. 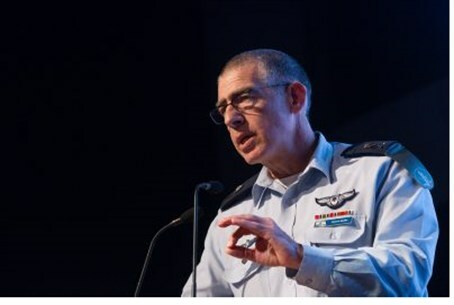 Maj. Gen. Nimrod Sheffer, the head of the Israel Defense Forces Planning Directorate, told Israel Hayom in a weekend interview that when Israeli leaders say “all options are on the table” with regard to Iran, they mean it. “If someone builds a nuclear bomb and at the same time declares that the State of Israel has no right to exist, then we have to think about how to respond,” he said. “It goes beyond a simple challenge." When asked if Israel might take “dramatic steps” in defiance of the American position, Sheffer answered positively: "When it comes to our national security, the answer is yes." “As long as Israel instructs its army to do what it has to do because that is the right thing to do for Israel's security, I think it will be accepted. That is why I am certain that any decision on this issue will not be the thing that destroys the relationship between the U.S. and Israel." The nuclear deal between the P5+1 powers and Iran, as it is emerging right now, “will not be a good deal for Israel,” he assessed. “If such a deal is ultimately signed, we will have to ask ourselves 'okay, what are we going to do with this?'" Prime Minister Binyamin Netanyahu issued his first public reaction Friday to Thursday's announcement of a "framework deal" between Iran and the P5+1 world powers over Tehran's nuclear plan. "Such a deal does not block Iran's path to the bomb. Such a deal paves Iran's path to the bomb. And it might very well spark a nuclear arms race throughout the Middle East and it would greatly increase the risks of terrible war," he said. "Iran is a regime that openly calls for Israel's destruction and openly and actively works towards that end. Just two days ago, in the midst of the negotiations in Lausanne, the commander of the Basij security forces in Iran said this: 'The destruction of Israel is non-negotiable.' Well, I want to make clear to all. The survival of Israel is non-negotiable.